Today Only: "Feels Like" Sale On Our Website! Warm Up With This Sale! Check Out Our "Feels Like" Sale! 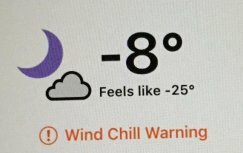 This morning in Bay City, the temperature was -8°, and the real feel temperature said it felt like -25°! To help you warm up while you stay indoors today, we're going to give you 25% off all regular priced items on our website with the coupon code "Feels Like"!Stock up and pick your order up tomorrow or have us ship it to you!